Phillip Kane, Goodyear's vice president for commercial tires in North America, talks about the firm's goals at the 2014 Goodyear Dealer conference in Nashville, Tenn.
AKRON—Goodyear executives are optimistic about the future of the industry and the future of its brand. "We're not just going to go into the future. 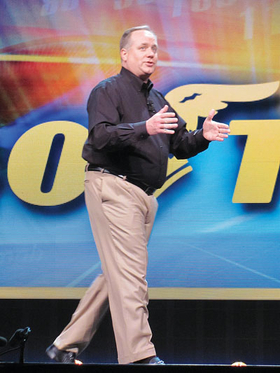 We're going to grow into the future," Phillip Kane, vice president for commercial tires in North America, said during the 2014 Goodyear Dealer conference in Nashville, Tenn. He said in an interview that in the commercial business, the company is looking for "a return to strengthen the replacement market" in 2014, "which will allow our replacement dealers some room to grow themselves." Steve McClellan, Goodyear North America president, added that when you think about the Great Recession and the years that followed, it has just been OK.
"There's been no big snap back in the general economy or in the tire business," he said. McClellan said all the signs are out there for a rebound, including an increase in miles driven. "It's not if, it's just kind of when is it going to happen. We wouldn't necessarily say we're predicting you're going to see the Big Bang in "14, but it's sooner rather than later ... but it's just not there yet," he said. Jack Winterton, president for consumer tires in North America, expressed a similar sentiment. He said the stabilization of fuel prices has miles driven going in a positive direction. He said Goodyear feels good entering 2014, but he does not think anybody is going to predict it's all going to hit at one time. 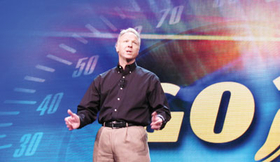 One sentiment that echoed through the speeches at the dealer conference is all segments of the business are aligned; they all have one strategy. McClellan said he wanted to express to dealers that "our strategy wasn't really new, it was evolving. And kind of the way they should feel about us going forward." "The whole theme was, no matter what we're doing here, it's about the Goodyear brand and driving consumers or customers to our dealers' locations to do business with them," he said. Even when Goodyear is involved in different areas, the goal is to drive customers to the stores. "While we love to be in races, we're not just there to win, even though we'd like to, we're in race to drive consumers to our dealers or our commercial customers to our dealers' outlets," McClellan said. Winterton said that all segments have the same basic philosophy: "Invest in the brand. Build the brand." He said that is all a part of the targeted market segmentation concept Good-year has. The segments differ in the varying parts of the business, but all use that concept and are growing segments of the market that require investment. These segments are growing faster than the industry and are areas where Goodyear wants to be. Winterton said being first with its customers is important to all segments in Goodyear. "It's something that we truly value, all of us." Kane added that it all comes together at the point of sale, "where Goodyear is aligned through our network and in creating the best possible experience that we can for our mutual customer, which is the end user." He said whether it's a consumer or a fleet on the commercial side of things, Goodyear wants to keep "the promise that we make to that end user." Winterton said the Goodyear brand and the programs it puts out "drives the demand" and that the company has to find the right business partners to capture the demand. Steve McClellan, Goodyear's North America president, discusses the many signs the industry has shown for a rebound during the years that have followed the Great Recession. The crossover utility vehicle market is an area that continues to grow in the industry, and Winterton said Goodyear attacks the market in a number of different ways. He said Goodyear's Wrangler SRA,and the Assurance FuelMax had double-digit sales growth combined last year, and both offer CUV sizes. Many of the company's premium tires also have CUV sizes and are doing well, he said. The original equipment market is another segment he said Goodyear continues to grow in. "We're extremely pleased with our OE relationships and the fitments we've been able to win," Winterton said. Goodyear continues to go after different fitments, and that has worked well. "I think our hard work and what we call the "OE selectivity' model ... is going to start paying off here in the future," he said. The winter tire market saw a bump up from previous years after the snowstorms of the season. "We had a very good (winter) tire market, and also I would think our customers would say the same thing," Winterton said. "They had a lot of inventory carry over from the year before, so that's all past history now." While there is a place for the all-season tire no matter where people live because a dry climate can change to a wet climate very quickly, he said there is still a market for the winter tire, especially with new vehicles. Goodyear is seeing great market growth in the premium tire market, Winterton said, because people want that peace of having all four new winter tires that have "the traction capabilities that you really need in snow." "It was a blur for a while and I think we're starting to see it spread back out, and I think it's because of the new vehicles," he said. Winterton said the Kelly brand is still a focus in the Goodyear line. "We're proud of all SKUs, and we will continue to invest in Kelly brand," he said. Kelly is mainly slated for the economy segment and is a well-known brand that customers like, according to Winterton. "Even though we didn't announce anything new this year, stay tuned. We will continue to invest in that brand." Overall, Goodyear "had a very, very good year in Goodyear brand, and we grew greater in the marketplace among our contemporaries, so that just tells you about the value that people are willing to pay for tires out there," Winterton said. He said that it is no secret that with the tariffs going off Chinese tires, the influx of the country's tires was strong in 2013. "We play in all segments and we're proud of the tires in our economy segment and we will continue to move forward with programs to sell tires in that segment," Winterton said. He said Goodyear will be bringing in new lines and offerings in the future.